The Common Mudpuppy (Necturus maculosus) is a large salamander that grows to over 19 inches (>48 cm) in length. Mudpuppies are paedomorphic, meaning that individuals become reproductively mature while maintaining what are typically larval salamander characteristics (such as gills) and do not undergo metamorphosis. Even the largest adult Common Mudpuppies maintain feathery gills and tall, paddle-like tails. Common Mudpuppies are harmless, though they do occasionally bark like dogs when captured and will rarely bite. While it may cause a minor amount of pain, the bite is harmless. Many inaccurate stories exist about the Common Mudpuppy (largely held by anglers), such as the salamander having a venomous bite or stinger. These untrue beliefs often lead to Common Mudpuppies being indiscriminately killed when caught on fishing lines or in minnow traps or nets. It was formerly a common sight to see piles of dead Common Mudpuppies on fishing piers along the Great Lakes. Despite its name, the species is considered at-risk or imperiled in 13 U.S. states and a Canadian province, and has potentially been extirpated from South Dakota. Major threats to the species include pollution of bodies of water, poaching for the illegal pet trade, collection for the legal pet trade, pathogens, and intentional killing by misinformed anglers. The Common Mudpuppy distribution is centered on the Great Lakes and Mississippi River drainages of North America. Disjunct populations exist in certain areas, most notably in Atlantic slope New England and New York. Historically thought to be introduced unintentionally by canal systems or intentionally by human introductions, the majority of these disjunct populations are currently believed to be naturally occurring, with the exception of Maine. Habitats are permanent bodies of water, including rivers, streams, lakes (natural and man-made), and ponds. The species is generally nocturnal. Diurnal microhabitats include places that the salamander can hide, including rocks, logs, and aquatic vegetation beds. Common Mudpuppies are voracious predators and will eat just about anything that can fit into the mouth including fish, crayfish, amphibians, worms, and other invertebrates. Adults move into shallower waters during the autumn months when mating commences. Adult females attach eggs to the bottom of stones or other structures the following spring. Unlike most amphibians, Common Mudpuppies are most active and most easily observed during the cooler months of the year and are regularly caught by anglers while ice fishing. The Common Mudpuppy is the only known host for the glochidia (parasitic larvae) of the globally-rare Salamander Mussel (Simpsonaias ambigua), which attach to the feathery mudpuppy gills. How does The Mid-Atlantic Center for Herpetology and Conservation help the Common Mudpuppy? 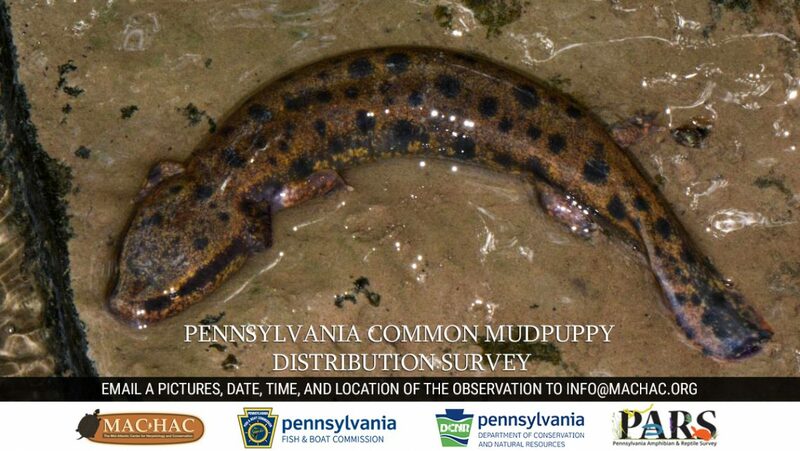 The Mid-Atlantic Center for Herpetology and Conservation has partnered with the Pennsylvania Department of Conservation and Natural Resources, through its Wild Resource Conservation Program (WRCP) funding, and the Pennsylvania Fish and Boat Commission, through the Pennsylvania Amphibian and Reptile Survey (PARS), to study the distribution of the Common Mudpuppy in Pennsylvania. The salamander is considered a “Species of Greatest Conservation Need” in Pennsylvania. The Common Mudpuppy has been confirmed in seven new counties by MACHAC since the beginning of the PARS and WRCP projects and found in a number of previously unknown watersheds. Anglers have a great opportunity to help us figure out the distribution and status of this species. If caught on a fishing line, you can try to remove the hook from salamander’s mouth with pliers. Deep hooks however, like with fish, will kill the salamander if you try to yank the hook out. The best bet is to cut the line as far down towards the hook as possible. Common Mudpuppies need to be in water to breathe, so please get them back into the water as quickly as possible after you take your picture. It is important to note that unintentionally catching Common Mudpuppies while fishing is not against the law, but intentionally killing them most likely is. Please help by simply taking a picture of any specimens encountered and emailing the picture, date, time, and location of the observation to [email protected].